Marijuana and alcohol are often pitted up against each other in an effort to determine which one is the healthier vice. This isn’t the case for alcohol. The World Health Organization (WHO) found 3.3 million deaths in 2012 were attributed to alcohol consumption. And recently, a comparative assessment published in Scientific Reports found alcohol to be 114 times more deadly than marijuana. That marijuana doesn’t lead to as many deaths as alcohol does doesn’t mean it’s without any serious side effects. At the end of the day, both are considered to be psychoactive drugs that affect mental processes and cognition when taken or administered, WHO reported. THC is the key ingredient in marijuana. It attaches to cannabinoid receptors throughout the body, some of which are more densely populated in certain parts of the brain: the cerebral cortex, hypothalamus, brain stem, hippocampus, cerebellum, and amygdala. The cerebral cortex plays a key role in memory, thinking, and consciousness — so it’s no surprise marijuana alters consciousness and impairs memory; the hypothalamus governs appetite, thus the munchies; and the amygdala plays a role in emotions, which is why some smokers experience anxiety, panic, and paranoia. In 2012, an Australian study concluded long-term marijuana use reduces the brain’s white matter by 80 percent. White matter is responsible for passing information between different areas of gray matter within the nervous system. Long-term use, too, has been linked to an increased risk for psychosis and schizophrenia (in pre-disposed people). In schizophrenic patients themselves, smoking marijuana worsens symptoms, Forbes reported. These negative side effects increase when smokers don’t know how much marijuana they’re taking — a more significant problem, it seems, when it comes to edibles. The New York Times reported a 19-year-old Wyoming college student jumped off his hotel balcony after eating a cookie infused with 65 milligrams of THC. Following this incident a month later, a man “began talking like it was the end of the world” before retrieving a hand gun from the safe and using it to kill his wife. That said, much of what people envision to be the effects of smoking marijuana aren’t entirely accurate. An article published in the New England Journal of Medicine suggested smoking marijuana lowers IQ in teens, yet separate research has shown this is only the case among “heavy” marijuana users; scores weren’t affected among “casual” users. In fact, a study published in the Journal of School Health found marijuana smokers tended to do better academically than their peers smoking cigarettes. Forbes added as possible as it is for marijuana to lead to psychosis, one study found marijuana’s other active ingredients, 9-tetrahydrocannabinol (THC) and cannabidiol (CBD), may work as an anti-psychotic. The same is true for the brain stem: While marijuana affects heart rate and blood pressure, it also controls nausea and offers pain relief. The Centers for Disease Control and Prevention reported a standard drink in the United States contains 1.2 tablespoons of pure alcohol. This amount is present in 12 ounces of beer; 8 ounces of malt liquor; 5-ounces of wine; and 1.5 ounces of 80-proof gin, rum, vodka, or whiskey. Drinking more than the standard amount becomes binge drinking, which the CDC found is the most common form of drinking. Women who binge drink will drink four or more drinks during a single occasion compared to men who will drink five or more drinks. Like marijuana, alcohol can make its way to the brain —it is a depressant after all. These sustained brain changes can alter a drinker’s personality. Prior research has used brain imaging and psychological tests in order to measure the most vulnerable areas, the National Institute on Alcohol Abuse and Alcoholism (NIAAA) reported; these are the cerebellum, limbic system, and cerebral cortex. Alcohol in the cerebellum leads to that loss of balance and stumble, while possibly also affecting memory and emotional response. Heavy alcohol consumption over time can shrink and disturb brain tissue, too. The thing is, from there, alcohol finds its way to the heart, liver, and pancreas. Alcohol’s short-term health risks range from car crashes, violence, alcohol poisoning, risky sexual behavior, and miscarriage or still birth. Each risk has a subset of additional risks; for example, violence includes homicide, suicide, sexual assault, and intimate partner violence. Excessive alcohol (as many people know by now) can increase risk for chronic diseases and other serious physical and mental health problems, including high blood pressure, heart disease, liver disease, as well as cancer, dementia, depression and anxiety, plus a slew of social problems. The CDC reported excessive drinkers are less productive; experience more family problems; and unemployment. Of course, those who excessively drink also put themselves at risk for alcoholism. There are, however, factors that make a difference, the NIAAA reported; how much and how often a person drinks is number one. A growing body of research suggests drinking alcohol moderately can improve a person’s health. Researchers from Brigham and Women’s Hospital in Boston found drinking seven drinks per week (one per day) was associated with lower risk of heart failure in men and a 16 percent lower risk in women compared to those who didn’t drink at all. One study published in Vaccine even found moderate alcohol improves the immune system’s response to vaccines. Unlike marijuana, which hampers creativity, alcohol may lead to more "Aha!" moments. As drinkers grow less aware of what's going on around them, unable to concentrate on tasks at hand (like operating a vehicle), a study from the university of Illinois found men with blood alcohol content just under the legal limit were more creative and insightful; a separate study showed advertising creatives allowed to drink as much as they wanted came up with better ideas than their peers who only drank water. 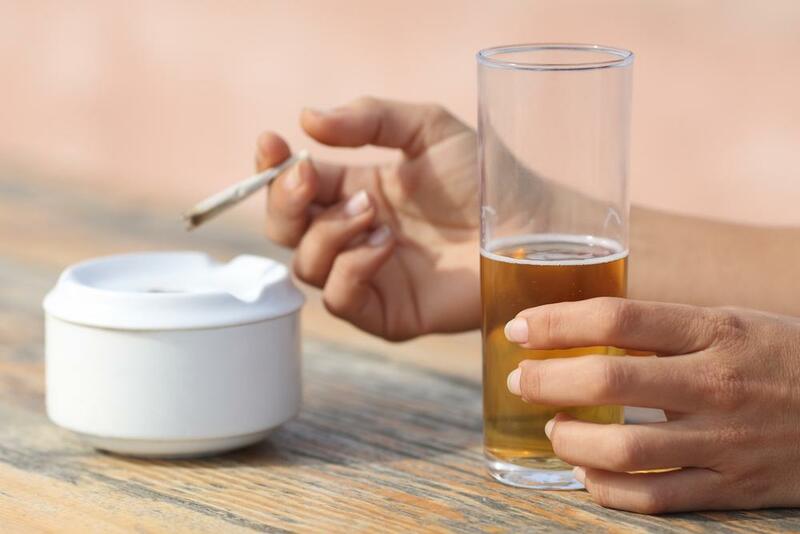 The bottom line: The way someone reacts to marijuana and alcohol will vary based on how much they use or imbibe, as well as any genetic predispositions (as is the case with marijuana increasing risk for schizophrenia). The general conversation surrounding these particular drugs has become more nuanced the more science and technology develops. As science forages ahead, we can expect to know more about the effects of recreational marijuana and alcohol use.